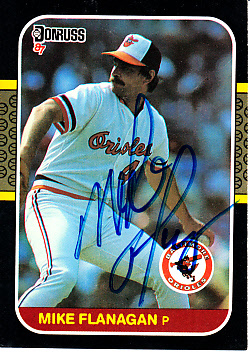 1987 Donruss card autographed in blue marker by the late former Baltimore Orioles ace pitcher Mike Flanagan, who won the American League Cy Young Award in 1979. ONLY ONE OF THIS CARD AVAILABLE FOR SALE. With certificate of authenticity from AutographsForSale.com.